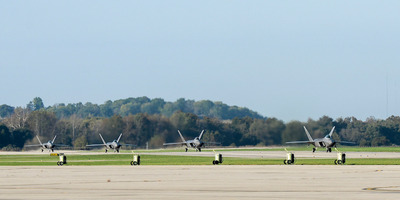 Wesley Farnsworth/US Air ForceF-22 Raptors from Tyndall Air Force Base in Florida taxi after landing on the runway at Wright-Patterson Air Force Base in Ohio. The aircraft have been evacuated from their base for the duration of Hurricane Michael. Military bases in Florida are preparing for Hurricane Michael, shutting down operations and in some cases issues mandatory evacuations. Aircraft from Tyndall and Eglin Air Force Bases as well as Hurlburt Field have begun evacuating to various locations. Only essential personnel can be on these bases during the storm. 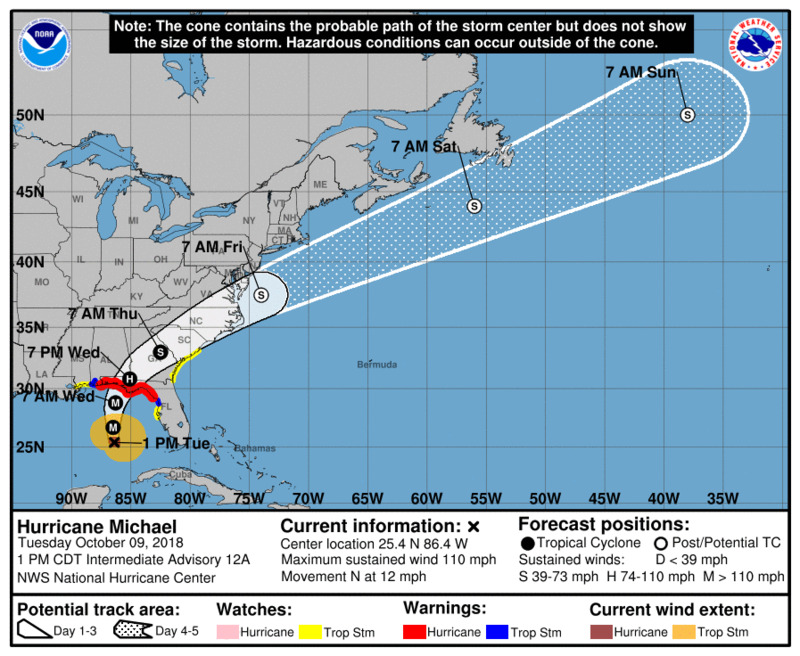 US military installations across Florida are gearing up for Hurricane Michael, shutting down operations and in some cases issuing evacuations for personnel and aircraft, according to the military and news reports. The National Hurricane Center estimates the Category 3 hurricane, with sustained winds of 120mph and gusts up to 150mph, will make landfall midday Wednesday. Preparations for Navy and Air Force personnel in the area are already underway. 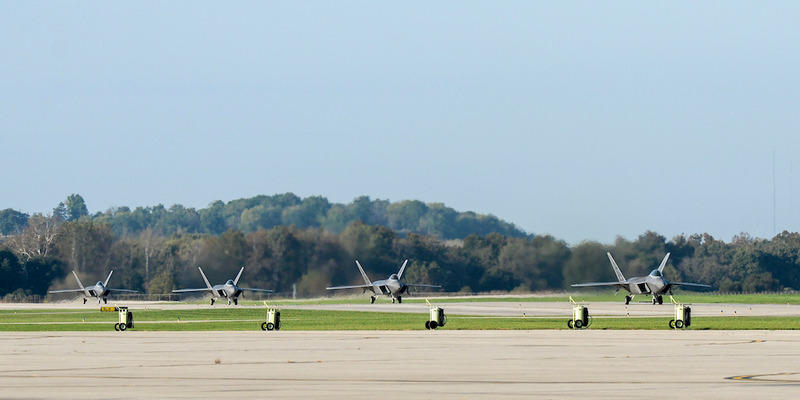 Aircraft from Tyndall and Eglin Air Force Bases as well as Hurlburt Field have begun evacuating to various locations, including Ohio and Arkansas, photos show. The bases will remain closed to essential personnel only and will cease outside operations for the duration of the storm. 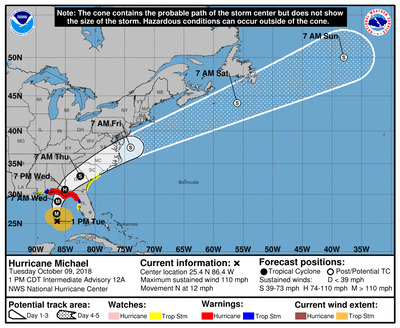 National Hurricane Center graphicNational Hurricane Center predicts Hurricane Michael will make landfall midday Wednesday. Bases in the hurricane’s path are already taking measures to protect its personnel and aircraft. So far, only Tyndall has issued a mandatory evacuation, although others say their personnel are able to evacuate if they feel the need, according to Air Force Times. According to the USNI News, the Navy is taking a similar stance in regard to its aircraft. “The Navy is in the process of tying down, hangaring, or evacuating aircraft,” Cmdr. Dave Hecht, spokesman for Naval Air Forces Atlantic, told USNI. According to the report, Naval Air Station Pensacola, the initial training base for naval aviators, shut down Tuesday afternoon, and will remain closed until Thursday. Local news reports show Naval Support Activity Panama City, Florida, an important base for Navy divers, has ordered a mandatory evacuation. Each of the bases located in Michael’s path has continued providing updates via Facebook.